This week’s edition of Shooting USA, which airs Wednesday, November 8, features the NRA Bianchi Cup. This competition is one of the most prestigious and popular events in the world of handgun shooting. Officially, the annual competition in Columbia, Missouri is known as the National Championship of NRA Action Pistol. But to everybody, world-wide, it’s the Bianchi Cup, the trophy named for one of the founders, John Bianchi. In the past 30 years the match has become the richest handgun tournament in the world, with cash and prizes for the best scores on four stages of fire. Shooting USA will spotlight top male and female Bianchi Cup competitors in both wheelgun and and semi-auto pistol divisions. Along with North American shooters, the Bianchi Cup draws top handgun competitors from around the globe. Shooting USA airs Wednesday nights, on the Outdoor Channel, at 9:30 pm, and 1:30 am (Thursday) — East Coast Times. John Scoutten and S&W shooter Julie Golob report the action from the Bianchi Cup. This year shooters from as far away as Australia, New Zealand, and Japan traveled to Columbia, Missouri in search of the perfect 1920 match score. Each round is the aggregate of the four (4) fired events: Practical, Barricade, Falling Plate, and Moving Target Events. Each of the four events requires 48 shots to complete. 480 points possible on each event. Three of the four are scored on the NRA tombstone P1 target. You must hit in the 10-ring or inner X-Ring on EVERY shot to shoot a “clean” 1920. Share the post "Shooting USA TV Features Bianchi Cup Competition"
Tonight, American Rifleman TV features the Bianchi Cup, one of the oldest, richest, and most prestigious pistol competitions on the planet. In 2014 over $500,000 in cash and prizes was up for grabs. That stellar pay-out (and the prestige of winning) attracts the world’s top pistoleros. This Bianchi Cup event was founded in 1979 by former police officer and holster maker John Bianchi. Success in the Bianchi Cup requires a perfect balance of speed and accuracy. The 192-shot championship allows a maximum aggregate of 1920 points across four timed events: Practical, Barricade, Moving Target and Falling Plate. In addition to being grouped by age, gender, and shooting skill, competitors may opt to shoot in the Open, Metallic, or Production divisions. Share the post "Bianchi Cup on American Rifleman TV Tonight"
The Bianchi Cup is underway. A record-setting 295 competitors are competing in the 35th anniversary of the NRA Bianchi Cup, which runs May 21-24 at the Green Valley Rifle & Pistol Club outside Columbia, Missouri. The first day at the 2014 MidwayUSA & NRA Bianchi Cup has just wrapped up and there’s plenty of shooting left. Scores are low and it’s still – theoretically – anyone’s game. The richest and most prestigious handgun shooting tournament in the world, the NRA Bianchi Cup draws skilled pistol shooters from all over the globe. They come for glory… and the loot. This year there will be $500,000 worth of cash and prizes up for grabs. This event was founded in 1979 by former police officer and holster maker John Bianchi. Success in the Bianchi Cup requires a perfect balance of speed and accuracy. The 192-shot championship allows a maximum aggregate of 1920 points across four timed events: Practical, Barricade, Moving Target and Falling Plate. In addition to being grouped by age, gender, and shooting skill, competitors may opt to shoot in the Open, Metallic, or Production divisions. Last year’s Open champion, Doug Koenig, is looking to notch his 16th Overall Title and his strong start at the Practical Event is a good first step. Among the other defending champions, past Ladies champion Jessie Duff (photos below) is eyeing a fourth title. National Police Shooting Championship legend Robert Vadasz hopes to earn a sixth Bianchi Cup title in the Metallic Sight Division. Shooters making their first appearance at the Bianchi Cup will be eligible for a special award from title sponsor MidwayUSA. The top three first-time men, women, and juniors will receive cash prizes of $2,500 for first place, $1,500 for second, and $750 for third. Share the post "35th Annual Bianchi Cup Kicks Off in Columbia, Missouri"
The 2013 MidwayUSA NRA Bianchi Cup is in the books. Congrats to the Top Guns of the men’s division: Doug Koenig First Place (center), Carl Bernosky Second Place (left), and Bruce Piatt Third Place (right). Though Koenig finished on top, we have to credit Carl for his versatility. Bernosky is the reigning (and 10-Time) NRA High Power Rifle National Champion. Few humans can rival Carl’s skills with a rifle, and he’s just proven that he is one of the very best with a pistol as well. Share the post "Koenig Wins 2013 Bianchi Cup, Bernosky Finishes Second"
The 2013 35th Annual NRA Bianchi Cup National Championship kicks off today, May 22nd in Columbia, Missouri, and runs through May 25th. This prestigious event draws shooters from all over the world. Along with the USA, competitors have come from Australia, Canada, Germany, Italy, Japan, Luxembourg, Netherlands, New Zealand, Russia, and Switzerland. Categories include: Open Division, Metallic Sights, Service Pistol, and Revolver. In addition there be awards for the top shooters in specific classes: Law enforcement, Women, Junior, International, Newcomer, Senior, Grand Senior. One of the favorites in the Women’s Division this year is Jessie Duff, shown competing with one of her Bianchi Cup custom rigs. Jessie’s pistol sports special brackets to help steady the gun during barricade shots. Share the post "35th Annual Bianchi Cup Championship Commences"
The 35th Annual Bianchi Cup is happening soon. The 2013 MidwayUSA/NRA Bianchi Cup Championship will take place in Columbia, MO, May 22-25. This major event draws shooters from all over the world. Along with the USA, competitors have come from Australia, Canada, Germany, Italy, Japan, New Zealand, Netherlands, and Switzerland. Firearm categories include: Open Division, Metallic Sights, Service Pistol, and Revolver. In addition there be awards for the top shooters in specific classes: Law enforcement, Women, Junior, International, Newcomer, Senior, Grand Senior. One of the favorites this year is Jessie Duff, shown below competing with one of her Bianchi Cup custom rigs. Jessie’s pistol sports special brackets to help align and steady the gun during the barricade shots. If you’re curious about the hardware used by top shooters in other action pistol events, here is Jessie Duff’s new Taurus PT1911 9mm single-stack, set up for Open Division. Note the extended, tri-port compensator attached up-front, and the large cut-out on top of the forward part of the slide. That cut-out is for weight reduction and improved balance. Interestingly, the rear of the slide is milled flat where the rear sight would be on a conventional model 1911. Jessie relies on her Leupold DeltaPoint red dot sight to get on target, so the pistol doesn’t need front or rear iron sights. 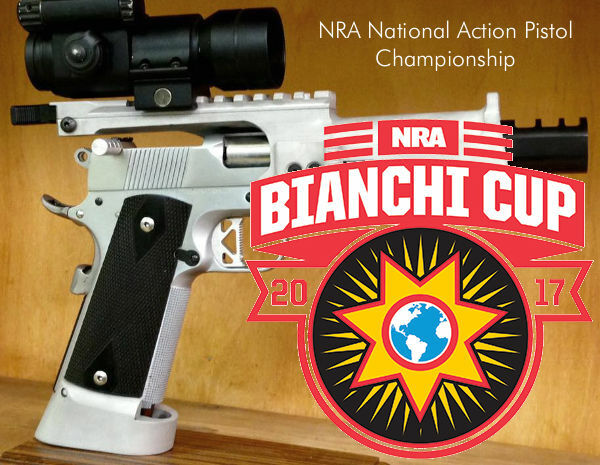 Share the post "Bianchi Cup Preview and Jessie’s New 9mm 1911"
The Bianchi Cup pistol competition concluded yesterday. Officially, the annual competition in Columbia, Missouri is known as the National Championship of NRA Action Pistol. But to everybody it’s the Bianchi Cup — the richest handgun tournament in the world. Overall and Men’s Champion was Doug Koenig. Team S&W Captain Julie Golob fought off a strong challenge from Jessie Rabb to win the Ladies’ Division. Robert Vadasz, a Border Patrol Agent, was crowned Metallic Champ, while Adam Lennert took home the Senior Champion Title. There were a number of skilled Junior shooters this year. The best of the lot was young Tiffany Piper. Joyce Rubino, Larry and Brenda Potterfield, Junior Champion Tiffany Piper, Metallic Champion Robert Vadasz, Bianchi Cup Champion Doug Koenig, Women’s Champion Julie Golob, Senior Champion Adam Lennert and Production Champion Vance Schmid. Share the post "2012 Bianchi Cup Winners Receive Awards"
This week’s edition of Shooting USA, which airs Wednesday, March 21st, features the 2011 Bianchi Cup. This competition is one of the most prestigious and popular events in the world of handgun shooting. Officially, the annual competition in Columbia, Missouri is known as the National Championship of NRA Action Pistol. But to everybody, world-wide, it’s the Bianchi Cup, the trophy named for one of the founders, John Bianchi. In the past 30 years the match has become the richest handgun tournament in the world, with cash and prizes for the best scores on four stages of fire. Shooting USA will spotlight top male and female Bianchi Cup competitors in both wheelgun and and semi-auto pistol divisions. Along with North American shooters, the Bianchi Cup draws top handgun competitors from around the globe. Shooting USA airs Wednesday Nights, on the Outdoor Channel, at 3:00 pm, 8:00 pm, and 12:00 midnight (Eastern Time). Share the post "Bianchi Cup Featured on Shooting USA This Week"
The October issue of Shooting Sports USA is now available. The October issue features complete coverage of the 2011 National Rifle and Pistol Championships at Camp Perry in an extended 42-page issue. The Smallbore, High Power, and Long Range phases of the National Rifle Championships are all covered in this issue, as well as the National Defense Match. You’ll find links to videos describing the National Trophies. There’s even a special note on how to stay in one of the historic huts on the Camp Perry base. Shooting Sports USA Editor Chip Lohman interviews Philip Hemphill, the 10-time National Police Pistol Combat Champion. Hemphill won his first National Pistol Championship at Camp Perry this summer. The October issue also features the second installment of a three-part series on how to deal with the pressure of competition. This segment features expert advice from top shooters such as Bianchi Cup Ladies Champions Jessie Harrison and Julie Golob. Want to get Shooting Sports USA delivered to your inbox each month? Simply CLICK HERE to register for your free ezines. Share the post "October Shooting Sports USA Magazine is Available FREE Online"